All 2004 Mustangs came with the 40th Anniversary badges on their fenders. There was also a 40th Anniversary trim package which could be applied to the V6 or GT models. But only in the paint colors of Crimson Red, Black, or Oxford White. Additional 40th Anniversary Package features include: Arizona Beige (silver) dual hood and trunk stripes; matching rocker stripes; upgraded wheels; and a deluxe parchment interior with painted center console surrounds, metallic gray shifter bezel and door lock knobs, shift boot trim, and brushed aluminum pedals. The Crimson Red paint was exclusive to the 40th Anniversary Package. Azure Blue 40th Anniversary Edition Mach-1 Mustang coupe with a black interior, 4.6L DOHC V8 engine, and a manual transmission. 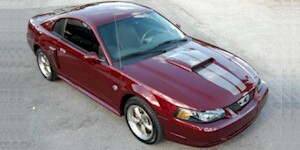 This paint color was only available on the Mach-1 in 2004. This 2004 Crimson Red, 40th anniversary, Mustang GT coupe was at the 2011 Mustang Roundup car show held in Bellevue, Washington. Crimson Red was exclusive to this special 40th anniversary Mustang but also came in, Black, or Oxford White. The 40th Anniversary Package features include: Arizona Beige (silver) dual hood and trunk stripes; matching rocker stripes; upgraded wheels; and a deluxe parchment interior with painted center console surrounds, metallic gray shifter bezel and door lock knobs, shift boot trim, and brushed aluminum pedals.